Continually updated, confirmed Long Beach shootings (fatal + non-fatal + no-hit): Most recent update: April 12, 10:50 p.m..
By comparison, L.A.'s Mayor/Council budget 2.47 officers per thousand residents (not including Airport/Port police.) 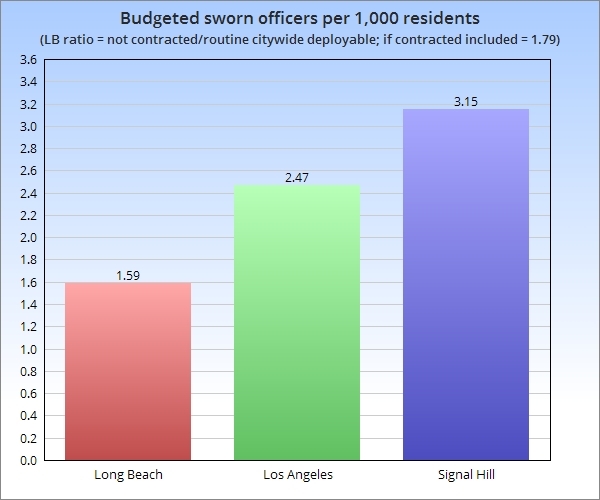 Signal Hill, surrounded by Long Beach, budgets 3.15 sworn officers per thousand residents for its taxpayers. Our LB ratio doesn't include officers that the Council doesn't allocate or pay-for; that number is decided -- and paid for -- by various entities that contract with LBPD to provide police services at LB's Port, Airport, LBUSD, LBCC, LBTransit, L.A. County Carmelitos housing and Metro. Contracted officers aren't routinely available during their contracted shifts to respond to citywide needs or to calls for service where you live (unless you live inside the Port, the Airport or on a LBTransit bus or a Metro train.) If the number of contracted officers were included, LB's FY19 budgeted police level would be 1.79 officers per thousand. For details on LB's FY19 citywide deployable budgeted figure, see LBREPORT.com coverage at this link. In FY17, LB's Mayor/Council restored 17 citywide deployable officers. In FY18. the Mayor/Council restored no additional citywide deployable officers. For FY19, Mayor Garcia recommends restoring 6 citywide deployable (bicycle patrol) officers while city management proposes shifting one citywide deployable officer to an Airport-contracted position, producing a net increase from FY18 to FY19 of 5 additional routine citywide deployable budgeted officers.. The net result for taxpayers as for FY19: 22 citywide deployable officers restored out of 208 erased...with 186 citywide deployable budgeted officers that LB taxpayers previously received yet to be restored. Mayor Robert Garcia has defended the current pace of officer restorations and in August 2018 balked at fully restoring the 180+ remaining officers he voted as a Councilman (2009-2014) to erase. LBREPORT.com coverage (with audio) here.